Networking has come a long way in terms of speed, reliability and flexibility and today we are looking at a piece of technology from Trendnet that aims to fill the gap between wireless networking and running cables everywhere. 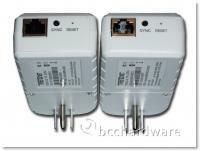 We will be looking at the 200Mbps Powerline AV Adapter kit. 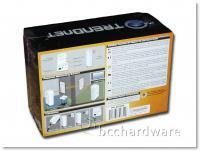 This kit uses the existing wiring in your building to run networking signals through. This kit has a bonus features of actually having wall receptacles built-in so it doesn't hog a wall plug. There are a few benefits to Powerline networking that are worth mentioning. First and most obvious, the infrastructure. It's already there. Most buildings have electrical wiring - at least in Canada and even some of igloos are wired. Second, there is no interference from wireless products. Even though these products have some range issues - they are rated to just under 1000' and this exceeds typical wireless networks and doesn't require line of site. Trendnet has several Powerline products currently available and they range from archaic 14Mbps products to their latest 500Mbps product. The 200Mbps kit that we're looking at today is their entry-level performance product that has the additional feature of having a "bonus" outlet. 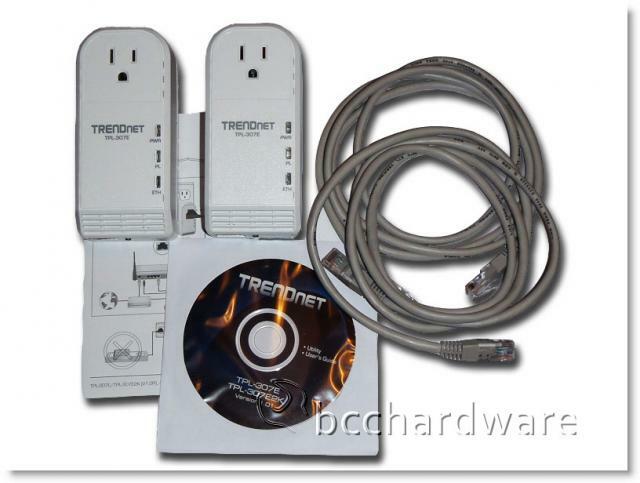 In typical Trendnet form, the TPL-307E2K kit comes boxed up in fairly nondescript packaging. It's not all that eye-catching if you're shopping at a retail store, but the 200Mbps sticker might turn your head and make you reconsider your wireless network. The back of the box shows how simple it is to setup and how quickly it should be to get working. Other than a few other specifications and disclaimers, there's not much else to look at here. 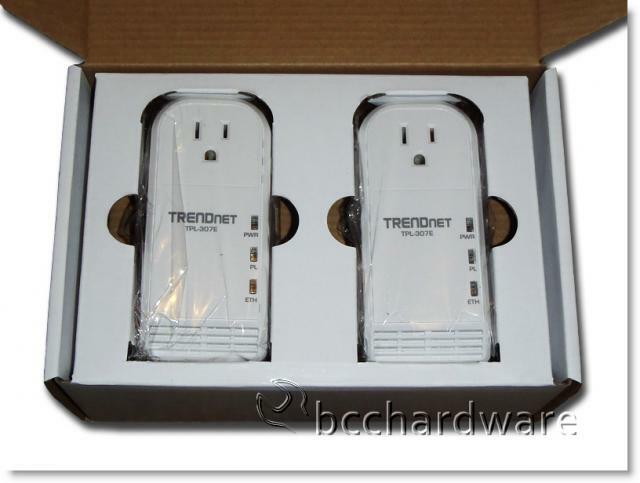 Trendnet has done a good job packaging up the kit and offers quick and easy access to the devices and this helps you get up and running in a matter of minutes. They've included everything you need to get plugged in to the wall, your network and your end-point device that you're trying to connect. There are a couple of 5' Cat 5e cables as well as a utility CD that also contains a user's guide. There is also a quick-install guide on a piece of paper if you can't figure out how to plug these into the wall or your network. There really isn't a lot to the device itself. They plug into the wall - something else can plug into them. They connect to your network by the Ethernet port on the bottom. You'll notice in the images below that there is three LED indicators on the front and a single button on the bottom. We'll cover these a bit more in the testing section. On the next page, we'll take a look at the features and specifications of the TPL-307E2K before we fire it up, take a look at the setup and interface then jump into testing. 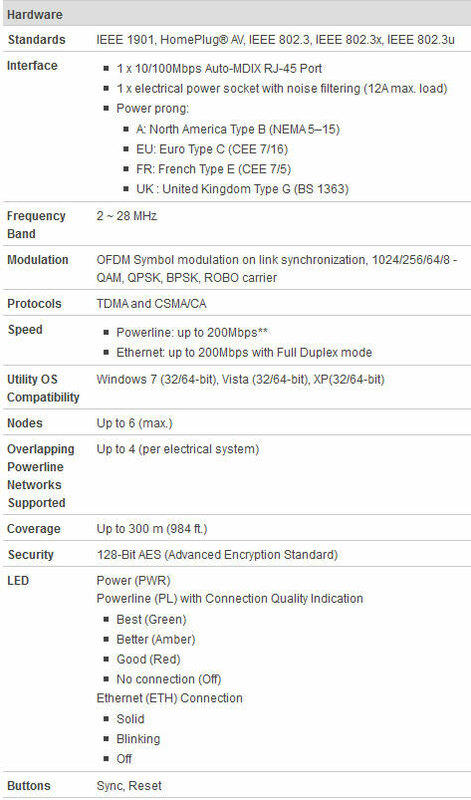 The following list of features and specifications have been pulled from the Trendnet product page for the TPL-307E2K kit. If you want complete information, please make sure to check their site for all the latest up to date information - including downloads and a lot more. 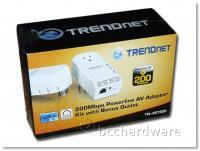 TRENDnet’s 200Mbps Powerline AV Adapter Kit with Bonus Outlet, model TPL-307E2K, comes with everything you need to build an HD Powerline network from any electrical outlet. Connect the first adapter to your network and plug the second adapter into any outlet on your electrical system for instant high speed network access. Never lose an electrical outlet with the built in outlet on the front of the adapters. The compact housing does not block adjacent electrical outlets. A noise filter maintains optimum connection speeds when household devices create electrical background noise. The adapters will automatically connect with no installation required—TRENDnet recommends pressing the ‘Sync’ button to automatically change default encryption keys. Use up to 6 adapters to network devices in different rooms without running new cabling. Power Save mode reduces power consumption by up to 80%. Quality of Service technology prioritizes video, audio, and online gaming. Advanced AES encryption secures your network. This adapter is ideal for use in buildings that interfere with wireless networking signals. It's very interesting to note a couple of things listed in the specifications above. First, although the sticker on the box clearly states that this is a 200Mbps product, the actual device has a 100Mbps port on it. I'm not sure how Trendnet can justify putting the label on the box that says the product is capable of twice the transfer rate that the port is cable of. That being said, if you read the fine print on the specifications, you will find the disclaimers below. * Maximum of 6 adapters (nodes) for streaming video across your network. ** 200Mbps is the maximum theoretical Powerline data rate. Actual throughput will vary depending on environment. So we can rightly assume that the best we're going to see from this kit is 100Mbps in a perfect environment. We'll see how that shapes up as we head onto testing. 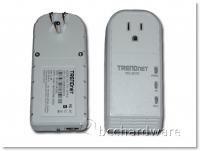 As I referred to previously, installation of the Trendnet Powerline Networking kit is a snap. It comes per-configured and synchronized to each other so that all you have to do is plug each of them into the wall and then plug the network cables into your devices. In order to connect to your network, you'll need to plug one into your router or switch and the other one into your device. Within seconds, they synchronized to each other and I had green lights all across the board. On the devices themselves, there are three lights on each. The top one lit up immediately as it indicates power to the unit. The second light shows the signal to the other Powerline network devices and it showed green when testing on the "Very Close" setting and turned to yellow at the "medium range" and "long range" tests. if it goes red, you still have connectivity, but it is poor. If it is off - well, your network is down. The bottom LED indicator shows that you have network activity and will blink as traffic is passed through the device. You can add a total of six of these devices to the same "network" without running new cabling or setting up anything special. This is not a huge network, but should connect most places where traditional wireless cannot work or perhaps you don't want to run a wired network. I don't often read instruction manual when it comes to testing products - or using products that I buy. I'm a "Let's see how easy this is to use" kind of guy, so I plugged the TPL-307E2K before I read anything much on the box of the website. I was surprised that when I plugged the Ethernet cable into my switch that the it showed am amber LED instead of a green LED. On my 1000Mbps switch, green indicates a full 1GB connection and amber indicates a 100Mbps connection. The TPL-307E2K clearly states on the box that it is a 200Mbps device, and I wondered how on earth they can get 200Mbps performance over a 100Mbps wired Ethernet port. I'll make this short. They can't. As I mentioned on the specifications page, the information states that the devices come with 100Mbps jacks. Any consumer buying the product though would see the 200Mbps sticker and expect to get that performance. Right off the bat, I discovered that the best I can do is half of that. On a wired 100Mbps connection, we often get 94Mbps - with a 6% overhead of inefficiency. Wireless networks, on the other hand typically get around 30%-40% of rated throughput so it will be interesting to see what kind of throughput we get on this 100Mbps Powerline kit. We ran performance number from this hardware over three different ranges. The "Short Range" setup was done in the same room - here in my office at BCCHQ South. The medium range was done in the same building, but the network was required to span a couple of floors. When it comes to long range testing, we actually moved the connected device to another building almost 200 meters away. This is pretty extreme and shows the benefit of a Powerline kit and how it can operate without line of site. On the next page we'll jump into testing before we wrap up with our final thoughts. As far as performance goes, we fired up iperf to do a little benchmarking on this router. Iperf results show bandwidth that the network is actually capable of. In the real world, you won't see wired transfer rates approaching 1000mpbs because hard drives are barely fast enough to read and write at this speed. Also, CPU overhead becomes an issue when transferring this much data. We use iperf with confidence as it shows how good the network hardware actually is and if it can perform anywhere close to its rated specs. As this is our only Powerline kit we've ever reviewed, we haven't compared it to other products. 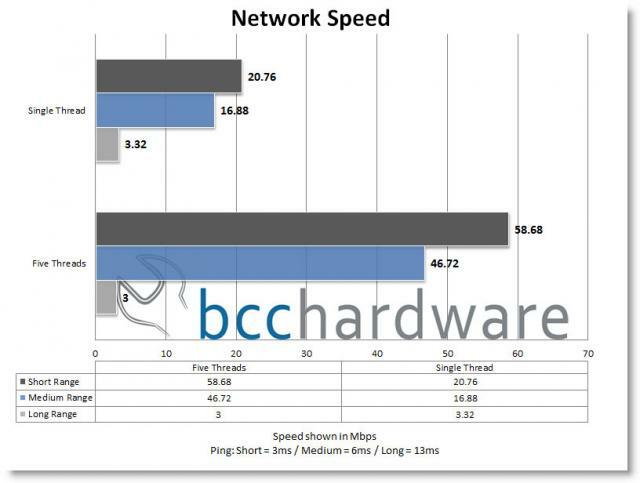 If you're interested in raw network performance comparisons, our latest router review of the Linksys E4200 has wired and wireless performance numbers that should compared to the "Medium Range" results of this product. In terms of the wired network performance on that review - range doesn't matter. Overall, the range of the TPL-307E2K impressed me. While the speed takes a serious hit over that much distance, we dropped no packets and the signal remained "good" (amber LED) all through the tests. Over medium range, performance was much better however and the ping was about twice as good. Short range performance is where this product shined - if you can say achieving 29% of the rated speed on the box is shining. Using a multi-threaded iPerf instance we managed to squeeze out an average of just under 59Mbps with a ping of 3ms. 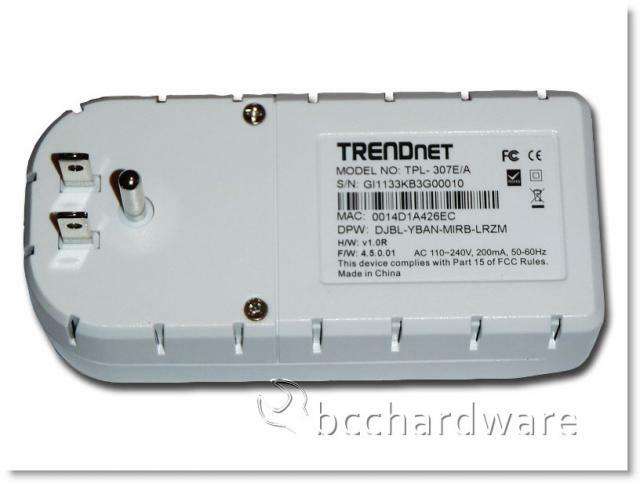 The TPL-307E2K from Trendnet is an interesting piece of hardware. Trendnet promises a lot with their advertising, but fails to deliver the claimed performance - not just by technical limitations, but by physical hardware insufficiencies. They cripple the product immediately by limiting the Ethernet port to 100Mbps so it cannot reach the 200Mbps speeds advertised on the box. Perhaps the chipset inside the device is capable of more than 100Mbps, but when they limit the input side of things, I seriously doubt it. The build quality of this kit seems pretty solid. I has a nice durable feel to it and the bonus outlet is very handy as I plugged it into the wall then plugged my laptop into the provided outlet. This is a great way to operate the device and it will allow you to have a couple of cords (network & power) running from the wall to your device. This is a great way to help solve cable clutter. The included cables were appreciated and are just the right length to hook to the device that you've plugged the power into. In some cases, a longer cable might be nice, but for most instances and typical uses of the TPL-307E2K, the cable length is just right. Installation is a snap. It's simple, straightforward, non-complicated and fast. You couldn't really ask for an easier product to install, setup and use. Performance. Ah... Where to begin? As previously mentioned, Trendnet operates under an umbrella of confusion with this product as they advertise speeds that it can't achieve. That being said, the fine print "clears this up", but the average consumer will not read this and become disillusioned with Trendnet once they notice their network performance is not anywhere close to what was indicated on the box. Overall, I have no frame of reference when compared to other Powerline products, but at short range, I'd expect a little better bandwidth. I understand that signal degradation occurs over longer ranges and this is what pulls the speeds down over our "long range" tests. I was impressed that we didn't experience packet loss, but in the end the 3Mbps performance was a little painful for file transfers. In terms of value, I've seen this kit on sale for as little as $90 and for that price they could be tempting in certain situations. Granted, they do have some performance issues and Trendnet has some marketing issues that they need to resolve, but for that price, they might be worth considering if you need a long-range network and don't have line of sight for wireless and simply cannot run a network cable. If Trendnet marketed these as 100Mbps adapters, I'd be happy to recommend them, but as they have tried pull a fast one on consumers, I would leave them be. Hopefully, we can try out the 500Mbps kit in the future and will test and judge their performance against these. 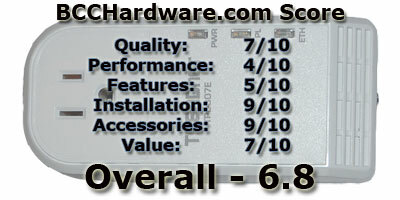 I would like to thank Trendnet for sending the TPL-307E2K kit over for us to review. We do look forward to following up this review with their other mainstream Powerline product in the future to see how it all compares. If you have any questions or comments, please post them in the forum at the "Comments" link below.